Biryani is a specially cooked rice, which is reserved for special occasions. Simple chicken biryani recipe is the most common and favorite biryani in biryani series. The process of cooking chicken biryani is easy to cook and not so difficult just need more time. Sultana’s recipe thus presents this recipe on the occasion of your special day. 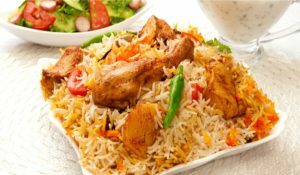 Among different types of biryani, this recipe tells you how to make the chicken biryani. With the taste and flavor of this biryani, you can very well attract anyone to your food table. This item is particularly a very favorite to the food lovers that you can test by putting such a dish in front of them. Although cooking biryani needs a lot of ingredients, yet Sultana’s recipe in its effort to simplify the recipe reduced some of the non-essential spices and made it as simple as possible. I believe you can try doing this as your special Day’s menu. Just take put the recipe before you and follow the step by step process. Cut the chicken into a medium size with a sharp knife. Approximately 6-8 pieces. Clean and wash the chicken pieces very well. Rinse very well. Add biryani spices and yogurt with chicken pieces and marinate the chicken pieces for 1 hour. Take a deep pan. Boil 5 cups of water. Add cardamoms, cinnamon sticks, bay leaves, and 1 tsp salt to the water. After boiling water, add rice to the water. When rice is ¾th done, take off and drain out water and keep aside. Take another deep nonstick saucepan. Heat the oil in another pan over medium heat. Add onion to the oil and fry it until golden brown. Strain out fried onion from oil with a strainer spoon and keep it aside. Put chicken pieces in hot oil and cook for 20-25 minutes over medium heat, or until the chicken pieces are tender. Take out all chicken pieces from the pan. Keep the chicken pieces aside. Put rice and chicken in layers alternately in a deep nonstick cooking pan. Finish with rice in the top layer. Spread ghee, milk, and fried onion on top. Cover with a lid and cook it for 20-25 minutes over low heat. Turn off the burner and keep the pan in the turned off burner for another 10-15 minutes. Take the cooked chicken biryani in a flat dish just before serving to keep it warm. Serve this chicken biryani with the fresh salad or only a fried boiled egg because it is independently a full dish. If you like my simple chicken biryani recipe please share this recipe with your family and friends.